Kryptane® industrial use skate wheels are the result of over twenty years of producing roller skate, skateboard, and inline skate wheels. Our urethane wheels have stood up to the abuse of several generations of skateboarders and inline skaters throughout the world in any condition imaginable. Kryptane wheels have been proven to out-perform all of the less expensive rollers on the market. Put our made-to-order capabilities to use for your next application. These products have found their way into many non-recreational applications where their low rolling resistance, high load carrying capacity, extreme durability, and range of sizes have allowed our customers to increase production and decrease operating costs. 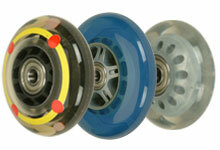 Like all of our made-to-order products, industrial use skate wheels can be made to fill a wide range of requirements.